Tales of the Grotesque and Arabesque is a collection of previously-published short stories by Edgar Allan Poe. It was published by the Philadelphia firm Lea & Blanchard and released in two volumes. The publisher was willing to print the anthology based on the recent success of Poe's story "The Fall of the House of Usher." Even so, Lea & Blanchard would not pay Poe any royalties; his only payment was 20 free copies. Poe had sought Washington Irving to endorse the book, writing to him, "If I could be permitted to add even a word or two from yourself... my fortune would be made." In his preface, Poe wrote the now-famous quote defending himself from the criticism that his tales were part of "Germanism". He wrote, "If in many of my productions terror has been the thesis, I maintain that terror is not of Germany but of the soul". The collection was dedicated to Colonel William Drayton, whom Poe likely met while stationed in Charleston, South Carolina; when Drayon moved to Philadelphia, Pennsylvania, Poe continued to correspond with him. Drayton was a former member of Congress turned judge and may have subsidized the book's publication. Contemporary reviews were mixed. The anonymous critic in the Boston Notion suggested that Poe's work was better suited for readers of the future; people of the time should consider it "below the average of newspaper trash... wild, unmeaning, pointless, aimless... without anything of elevated fancy or fine humor." Alexander's Weekly Messenger, on the other hand, remarked that the stories were the "playful effusion of a remarkable and powerful intellect." Likewise, the New York Mirror complimented the author's intellectual capacity, his vivid descriptions, and his opulent imagination. Even with those positive reviews, the edition did not sell well. When Poe requested a second release in 1841 with eight additional tales included, the publisher declined. 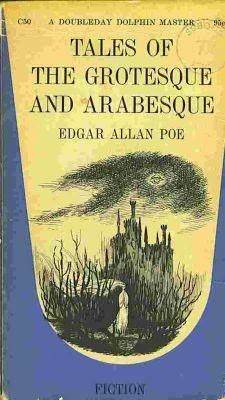 Poe's first collection, Tales of the Grotesque and Arabesque, appeared in 1840. It contained one of his most famous work, 'The Fall of the House of Usher.' In the story the narrator visits the crumbling mansion of his friend, Roderick Usher, and tries to dispel Roderick's gloom. Although his twin sister, Madeline, has been placed in the family vault dead, Roderick is convinced she lives. Madeline arises in trance, and carries her brother to death. The house itself splits asunder and sinks into the tarn. The tale has inspired several film adaptations. Roger Corman's version from 1960, starring Mark Damon, Harry Ellerbe, Myrna Fahey, and Vincent Price, was the first of the director's Poe movies. The Raven (1963) collected old stars of the horror genre, Vincent Price, Peter, Lorre, and Boris Karloff. According to the director, Price and Lorre "drove Boris a little crazy" – the actor was not used to improvised dialogue. Corman filmed the picture in fifteen days, using revamped portions of his previous Poe sets.